The first RS-11s were produced by Alco in early 1956. 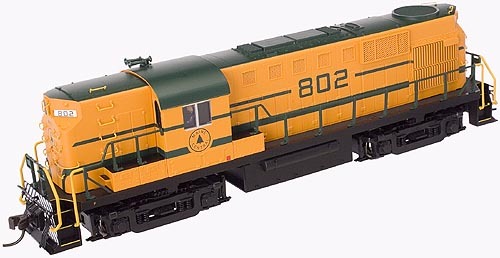 This locomotive, classified by Alco as model DL-701, was their replacement for the very popular RS-3 road-switcher. Featuring a V-12, 1,800hp 251B diesel engine, the RS-11 was Alco?s answer to EMD?s very successful GP9. The turbocharged RS-11 accelerated faster, had a higher tractive effort rating and typically used less fuel than the competition. It was also quite versatile and could be found in heavy haul freight as well as passenger service. The largest owner of RS-11?s was Norfolk & Western which purchased a total of 99 units (an additional 35 were added to the fleet after the merger with Nickel Plate). Other major purchasers included Northern Pacific, Pennsylvania and Southern Pacific, all of whom placed repeat orders. With approximately 426 units built for the US and Mexico over 8 years of production, the RS-11 was successful for Alco in that it provided ongoing competition for EMD?s popular road-switchers. A few examples of this model are still in service today and can be found working for various shortlines in the US. N RS-11 Locomotive - New Paint Schemes! Products bearing Missouri Pacific or Southern Pacific marks are made under trademark license from Union Pacific Railroad Company. New Road Names & Road Numbers! N 53' Evans Double Plug Door Box Car - New Road Numbers! N 53' Evans Double Plug Door Box Car - New Road Names! The Atlas Trainman N 40 ft PS-1 Box Cars are the perfect addition to your freight car fleet. Based on the Pullman-Standard prototype, these models have been carefully detailed to capture the look of the car perfectly. Atlas N Trainman 40ft PS-1 Box Car New Trainman? Paint Schemes! Atlas N Trainman 40ft PS-1 Box Car New Road Numbers! Atlas N Trainman 40ft PS-1 Box Car - New Paint Schemes! Products bearing Southern Pacifc, Rio Grande or Union Pacific marks are made under trademark license from Union Pacific Railroad Company. Products bearing MKT or Union Pacific marks are made under trademark license from Union Pacific Railroad Company.